NEW YORK, NY--(Marketwired - October 26, 2016) - SoOum Corp (OTC PINK: SOUM), a Physical Commodities Arbitrage and e-Commerce Company, which recently acquired Western Grade LLC, a civil contractor, announces approximately $365,000 USD in revenue from its current pipeline of business. Three (3) of Western's six (6) jobs in progress are coming to completion; two (2) are on schedule to be completed by week's end. The larger of the two (2) jobs consisting of demolition, utilities, grading, and paving, has a value of approximately $250,000 USD. The smaller jobs, a storm drainage and site grading project in the private sector has a value of approximately $45,000 USD. While another project (milling, grading and paving) in the government sector is on schedule for completion by the end of the month, with its value reported to be approximately $170,000 USD. Founded in 2001 Western Grade LLC is a well-respected general contractor capable of domestic, as well as Commercial and Industrial projects. With unsurpassed expertise, and state of the art technical capabilities, Western's commitment to success and outstanding customer service were, and remain a leading catalyst for the company's growth. Statements in this press release regarding the Company's business which are not historical facts are "forward-looking statements" that involve some risks and uncertainties. The Company cautions that various factors, including the factors described under the caption forward-looking statements in the Company's annual report on Form 10-K, could cause actual results to differ materially from the statements contained herein. These factors include business conditions and volatility in the commodities market, and the general economy. Competitive factors including compressed gross profit margins; shifts in market demand; product availability; reliance on key customers; fluctuations in foreign currency exchange rates; income tax legislation; and the risk factors listed from time to time in the Company's reports filed with the Securities and Exchange Commission. The Company undertakes no obligation to update any forward-looking statement. 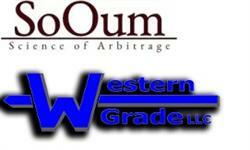 SoOum Corp (OTCPINK: SOUM) a Physical Commodities Arbitrage and e-Commerce Company, which recently acquired Western Grade LLC, a civil contractor, announces approximately $365,000 USD in revenue from its current pipeline of business.